As promised, here is my version of a traditional quilt block. Print out both pages. You may use this pattern for your own use free of charge–just tell ’em where you got it. Since my husband served in the Air Force, I’ll make my Soldier Boy using blue fabric. 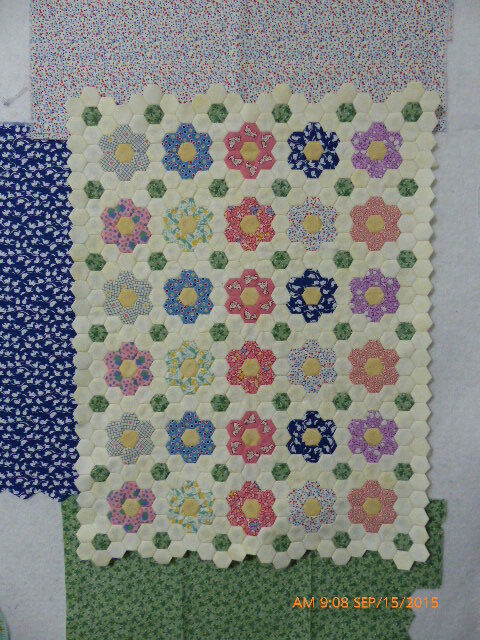 I have previously made this block in light tan for a Quilt of Valor. These quilts are distributed to wounded soldiers. Check with your local quilt guild or go to the link for more information. 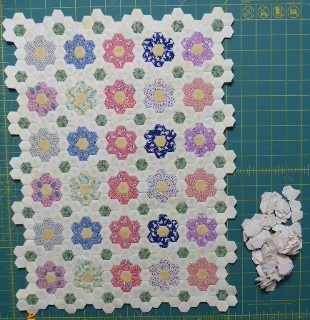 READ THROUGH THIS ENTIRE POST BEFORE STARTING, ESPECIALLY IF YOU HAVE NEVER PAPER PIECED BEFORE. If you have questions, email me. 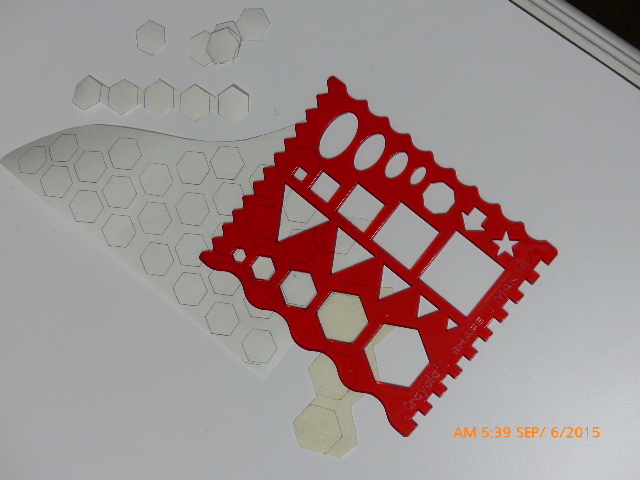 After printing the paper pieced units, trace them onto quilting paper or tracing paper. Either of these will rip easily away when you are finished sewing. Sew several stitches beyond the outside line or the stitching lines will not be caught when you sew the units together. I also used a colored pencil to denote where my blue fabrics were placed. I had the fabrics reversed in my first draft so my first unit was all wrong. Do over. After you are finished tracing, cut out the other fabrics as directed on page 1 (Soldier Boy). After tracing, cut out leaving 1/4-inch seam allowance around. Then pre-fold each line of the paper. 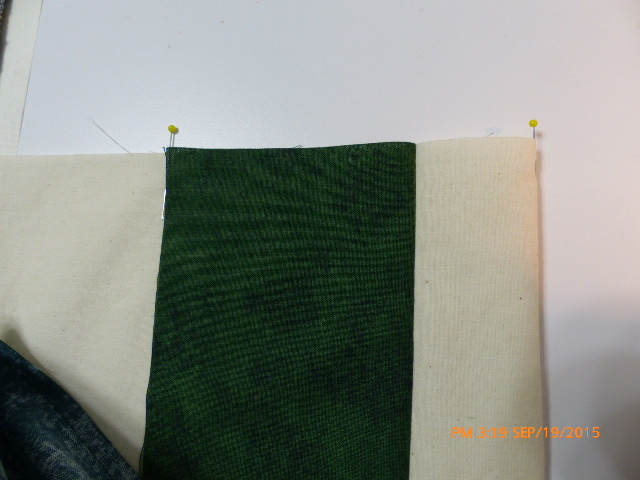 Start with a background piece of fabric (1b). The paper will be face down and the fabric will be right side down. 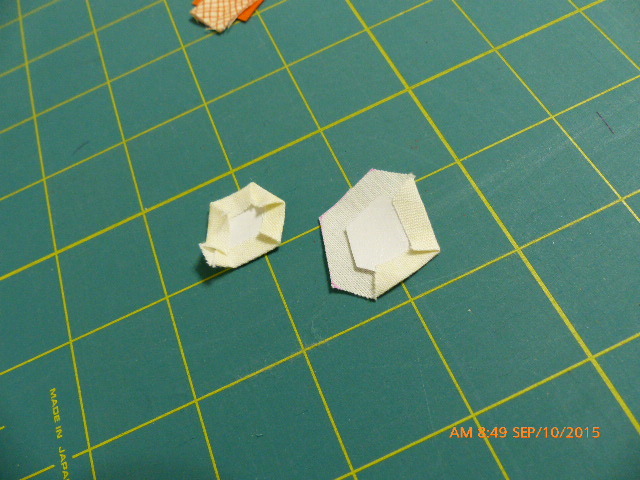 Fold the paper back and cut the fabric including 1/4-inch seam allowance as shown. (The photo is actually after adding fabric 2). The process is always the same–fold the paper back, add a seam allowance, add the next fabric (right sides together), sew. Set your stitch length to about 1.5 instead of the default (2.2). Here #2 is sewn to #1; finger press the seam. Continue until all pieces have been sewn. Trim the outside edges, being sure to add the seam allowance, unlike I did here on the end. I had to go back and resew the last two pieces. When you paper piece the hat, start with the background fabric. Usually, you leave all the papers attached until you sew your units together; in this case, go ahead and remove the papers. Fold the paper back at the seam line, and tear away. Position all of your pieces as shown below. Sew each vertical row. Press toward the dark fabric EXCEPT, press away from the hat toward the face–your seam will lie flatter. Then sew the rows together. Press your final seams as shown. Here is my finished fly-boy. His name is Dave. Isn’t he 35-10? If you wish to add a face, here are a couple of ideas. You could also embroider the face. If you’re not sure about adding a face, iron a piece of freezer paper to the back of your face fabric (stabilizes the fabric for drawing) and draw before piecing your soldier. I TOLD you to read all the directions first. I hope you enjoy making this block. Till next time, be kind and do something creative. Better yet–make a Quilt of Valor. 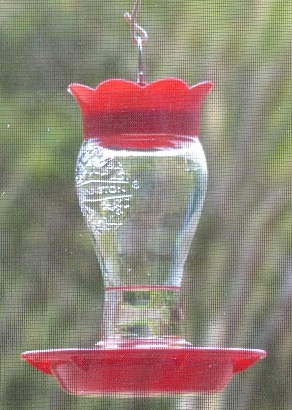 Here is one I made–all my other photos are non-digital. I quilted this with a loop-d-loop with stars design in variegated red/white/blue thread. 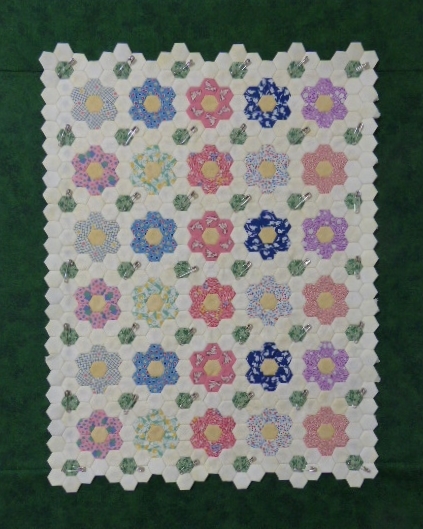 The center medallion was an original block; the star blocks were a block of the month (Star-Thangled Banner, 2008) by Jan Williams, Calico Cut-Ups Quilt Guild. And if you like mystery quilts, go to the following link. The quilt is in red/white/blue and started in January 2016. You can print out my directions for printing quilt labels on your home computer by clicking on the link. I will show you step by step photographs in the post, but first we should talk about what information you should put on your label. Why make a label for your quilt? If you give your quilt as a gift, a label can denote a special occasion such as a birthday, wedding or baby gift. I title my quilts and give some details about the quilt including techniques, date finished or presented, my name/city/state, anything of historical or general interest. I have also starting adding dimensions of the quilt. Historical significance. There is a lot of documentation and research being done on quilts. You can make it easier for your descendents and researchers by labeling your quilts as you finish them. There are some wonderful quilts out in the world with no history as to who made them, who they were given to or why they were made. You can sometimes date a quilt by the fabrics used but it can really add interest to a quilt with specific information as to maker and date finished. NOTE: The date denotes the last time the quilt was worked on. If you finish granny mommy’s quilt and add new fabrics, you must use the current date. You can always add that the blocks were made by so-and-so in 1920, but if you added borders, backing and quilted it yesterday, you need to document the quilt as being finished in 2015. This information may not be important to you or your kids, but it may matter to someone else down the line. If nothing else, it is fun to know why a quilt was made. Here’s a sample of one of my recent labels. On to the tutorial. Always read the directions first before starting. I”ll give you resources at the end. Make a new document with your quilt information. I put my page on landscape and formatted two columns. I can usually get four labels per page this way. Leave space between the labels so that you have at least 1/2-inch margins all around for turning under edges. I sometimes use the enter key to shorten up each line. Set up your printer ahead of time to print best quality. Prepare the fabric for printing. 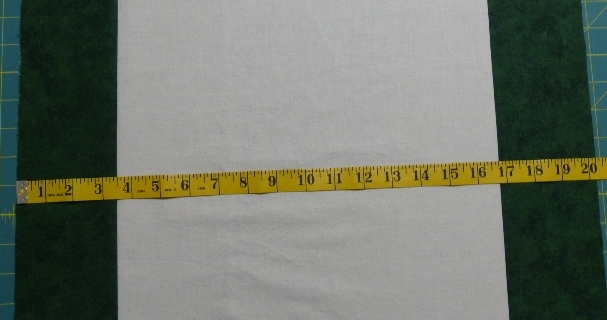 Cut a piece of fabric slightly more than 8-1/2×11 inches. Shake bottle well and pour enough Bubble Jet Set 2000 into the bottom of an aluminum tray to cover the fabric. Using rubber gloves, make sure the fabric is saturated and soak for 5 minutes. 2. Using rubber gloves, let fabric drip into tray and lay flat on an old towel. Do not wring fabric. Pour remaining Jet Set back into bottle for reuse. 3. Let fabric dry. I use a hair dryer to speed the process and then finish drying with the iron. 4. 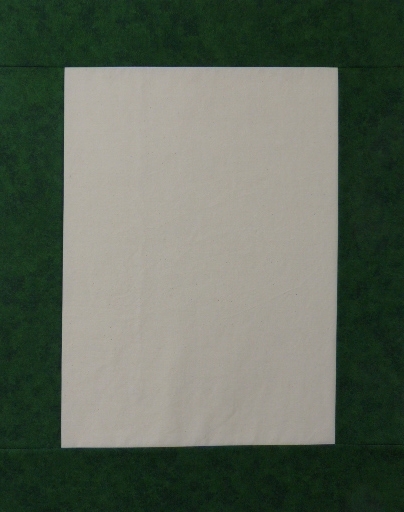 Press the shiny side of a sheet of heavy duty freezer paper to the wrong side of the fabric. 5. 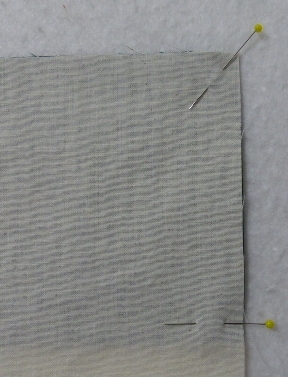 Carefully trim the fabric to 8-1/2×11 inches; press the edges again. 6. Place the fabric/freezer paper fabric side down in the paper tray. (This is how my printer works–check yours.) Print. Let stand for 30 minutes. 7. Remove the freezer paper from the fabric, being careful not to distort the fabric. 8. Using the timer again and rubber gloves, swish the fabric in cold soapy water for 2 minutes. Rinse until all the soap is removed. Let the fabric drip into the tray and dry as before. 9. Cut your labels, leaving 1/2-inch on all sides. 10. Press under the edges. To miter corners, open up the corners as shown, fold down a triangle and fold in each side. 11. Pin the label to the bottom left side of your quilt, looking at it from the back. Blind stitch the edges down. You now have a professional looking label and wonderful documentation for your quilt. If you followed the directions, the label will be permanent and totally washable.